K&N 77-1533KP - K&N 77 Series Metal Intake Kit - FREE SHIPPING! I installed my K&N on my 2004 Dodge Hemi I noticed a big difference in horsepower and I love the way it makes my truck sound also installed a throttle body spacer what a combination awesome!!! Previously had a spectre cold air intake but it broke. I went with K&N for a new one. It is much better. I like that the pipe is mounted to the air box. This allows for the pipe to have some flexibility at the throttle body. The Spectre one was too ridged and was shearing the mounting bolts. This is a much better design. Maybe even a little bit louder at lower RPM. The only think I don't like is the air box moved a bit closer to the fire wall and does not line up with the ram air hood. Intake has a great look and replaces a lot of plastic! Only seeing about 2-3 mpg on highway but that's still 50-75 miles per tank further I can go install was pretty east but the bracket that connects to the computer bolt rattles against the fender so I put foam between them. For the 05 Ram Go plastic! 2 hour install. K and N sticker is on the top of tube instead of front. Nice filter. Bad design. Kinda encloses in a box that really pulls hotter air vs the original stock air box. Makes a small cool whistle and whoosh sound when u quick punch it and a deep throaty sound. Honestly my truck sounds worse with it on tho. The EGR valve that recirculates exhaust back into the intake makes a loud ticking sound at certain throttle points cuz it resonates of the metal pipe. Go plastic. Friday after a long hard week I enlisted my daughter to help me install this system in my truck. She's 16 and jumped at the chance to do something most boys these days don't get to. We proceeded with the instructions step by step and she or right in the dissembling the stock intake and helping me out together and install the new one. 1.5 hrs later it was complete, we went for a ride an was amazed at the increase in the deep sound it added when accelerating. 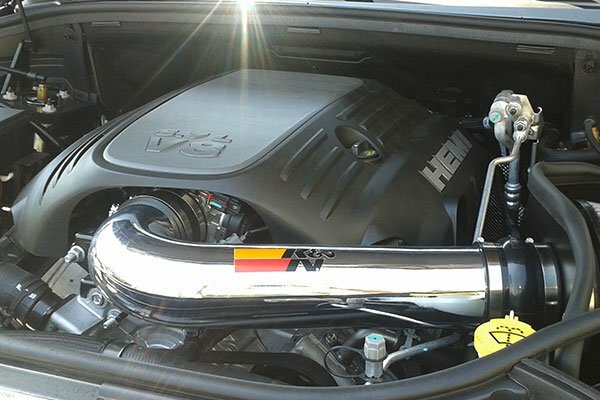 The K&N 77 Series Cold Air Intake gives my 5.7 hemi so much torque at takeoff. Dont know how much H/P yet, but its great ! Try it your like it !! Now for the SuperChip !!! gave the hemi in my ram a great throaty sound and improved power and throttle response just like it claims. tough to tell if the mpg has improved. Easy to install, and increased the sound of my engine. Awesome cold air intake...other than a lil pricey....sounds amazing.buy one!!!! 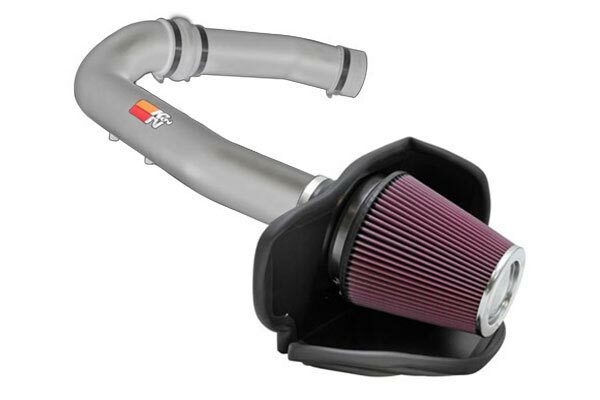 highly recommend getting this intake, it made a very noticeable change in response, power, sound and milage! Love it!!! K & N CAI Rocks! I've had the K & N CAI 77 Series on my 2008 Dodge Ram 1500 Quad Cab 4 x 4 for 3 weeks now and I love it. Sounds baaaad and I've noticed an increase of 1 - 2 mpg. The K&N Intake Kit was easy to install and it looks great. My Dodge Ram Hemi sounds great now. I definitely noticed a difference in the gas mileage and the horsepower. Great product looks and sounds like nothing other. 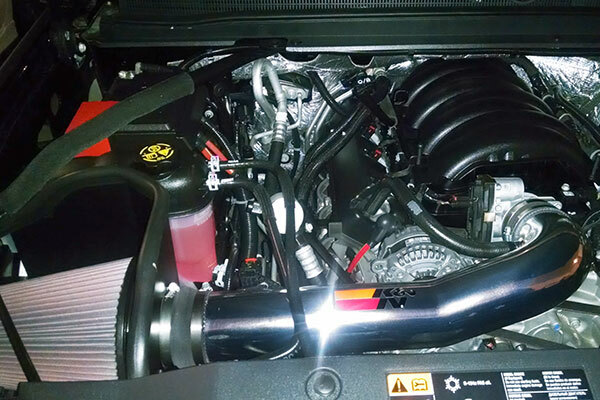 I installed the new K&N intake on my Dodge Ram 5.7L Hemi about a week and a half ago. I immediately noticed a change in the sound when I accelerate. It works well with my new dual exhaust system. The intake was easy to install, especially when I took the time to pre-assemble some of the parts in the house. I love the way it looks on the engine. Awesome sound!! Makes the flowmaster 40 series scream. The one thing they need to change is where the Air Temp sensor is located. 18 of 48 people found the following review helpful. VERY DISSATISFIED WITH THE OVERALL PERFORMANCE OF THE INTAKE KIT. IT IS VERY LOUD WHEN UNDER HEAVY THROTTLE AND I ALSO HAD A DECREASE IN GAS MILEAGE. I really didn't think that this could do that much for my truck. I have a 2003 Dodge Ram 1500 HEMI, and it made a big difference. I am really glad i got one. Improved gas milage too. Intake kit sounds great inproved performance not as shifty in trans. as before . Still have not seen any inprovment in gas millage witch was my main reason for purchase. Have not been to heavy on gas pedal but at times hard to stay off of it. Have it on work truck with big utility box lot of weight so other trucks it may inprove millage. Placed a K&amp;N cold air intake on my 2006 Dodge Ram 1500 with 5.7 hemi. So far I have gotten worse gas mileage, but I have only run one tank full. If it does not improve I'll switch back to the stock air intake. It does look and sound good though. Pretty easy to install. Sounds great and you can feel the difference in torque when you take off. Gas mileage seems a little better but early to tell. Thanx K&amp;N! It took a little more time than expected to install but once I had it up and running. The vehicle was a lot louder, more power, and if i keep my foot off the gas pedal. Better on the wallet for gas. I would highly recommend this intake to anyone. Reference # 767-611-420 © 2000-2019 AutoAnything, Inc.